The ECS5610-52S is a high density 10Gb Ethernet switch encased in a small 1U form factor. This switch meets the high performance, availability and network scaling requirements of enterprise and cloud data centers. Deployed as part of a distributed spine network, the ECS5610-52S provides full line rate switching at Layer 2 or Layer 3 across 48*10GbE ports with 4 x 40GbE uplinks. 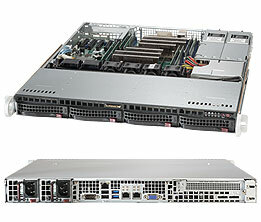 The ECS5610-52S is capable of 1.28Tbps of network throughput. Given the demand for bandwidth brought on by server virtualization. Dual hot-swappable power supplies allow the system to continue operation even in the event of a single power supply failure. To ensure longevity, the ECS5610-52S employs data center-friendly front to back cooling, dissipating unwanted heat efficiently and effectively. With Ethernet fast becoming the de facto standard for the interconnection of data center devices, the ECS5610-52S is conceived and designed to overcome the challenges in a high traffic load environment, ensuring that traffic flows smoothly through the network without delay. It features Jumbo frame up to 12K bytes. The ECS5610-52S is easy on the environment as well as your energy budget. 175W typical power consumption at full line rate forwarding over 48 x 10GbE DAC cables and 4*40Gbase-SR4. The ECS5610-52S features both an user-friendly web interface and a command line interface for the advanced user. SNMP based management is also fully supported. When used in conjunction with ECView Pro, Edge-Core own network management system, the task of monitoring and provisioning can be easily accomplished. TOR Switch for 10GE Data Center: The ECS5610-52S can be deployed as a ToR switch to interconnect up to 48 units of 10GE servers in the same rack while providing 4 ports of 40GbE uplinks to interconnect to the data center SPINE switches. SPINE Switch for 1GE Data Center: The ECS5610-52S can also be deployed as a SPINE switch interconnecting up to 48 ECS4510 or ECS4610 together in a star network topology. In this deployment scenario, ECS4510/4610 will act as a TOR switch interconnecting up to 48 units of 1GE severs in the same rack. 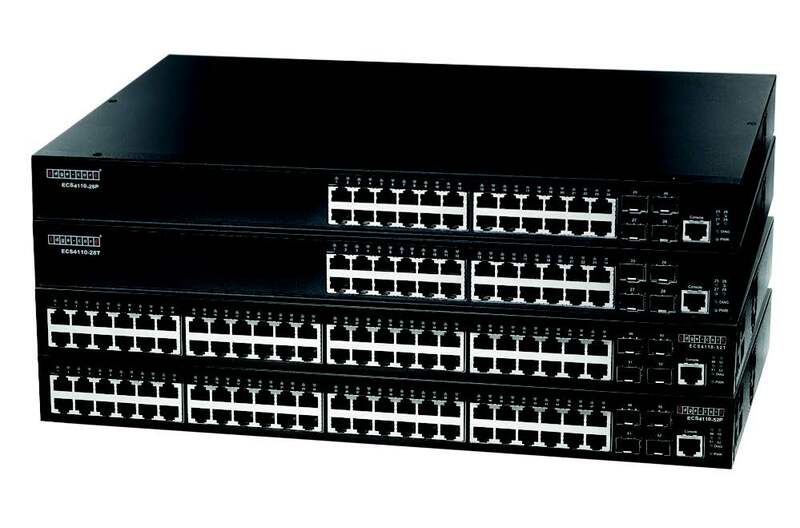 Campus 10GE Aggregation Switch: In the Enterprise campus environment, the ECS5610-52S can also be deployed as an aggregation switch interconnecting up to 48 ECS4510 or ECS4610 together to form a medium-size L2 or L3 campus network. In this deployment scenario, the 4 40-GbE uplinks can be used to interconnect multiple ECS5610 to form a large-size campus network. The Edge-Core ECS5610-52S is a 48-port 10GbE SFP+ with 4-port of 40GbE switch designed from the ground up to be deployed and utilized in medium to large data centers and Enterprise Campus. The ECS5610-52S is designed for high-availability and mission-critical Enterprise environments in 1RU enclosure with redundant, hot swappable, load-sharing PSUs along with hot swappable fan try with n+1 redundant fans; and port-to-power and power-to-port airflow direction options.